Rhino enables accurate, flexible, and fair hull design with the Rapid Hull Modeling Methodology. This method is developed by RhinoCentre in cooperation with other professionals in the marine industry. 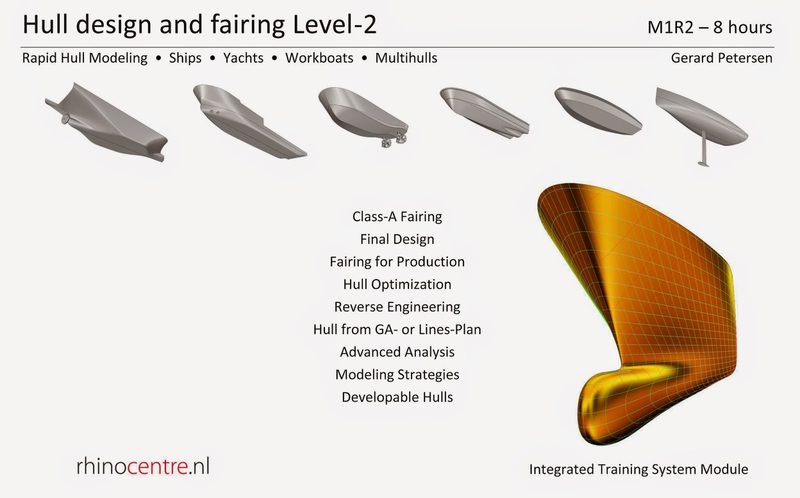 After years of offering training and services to leading companies in the marine industry worldwide, RhinoCentre finally developed the unique training modules: Prepare2d input and Hull Design and Fairing Level-1 and Level-2. Trainer: Gerard Petersen is naval architect, founder of RhinoCentre and has used Rhino since 2001 in his projects in the most integrated way. Petersen developed hull design and fairing skills to be able to develop innovative concepts with unique hull shapes like the integrated trimaran Kenau. The trimaran project proved that Rhino is a professional tool to turn an idea into reality.